Viki is a translation and captioning community for popular TV shows, music videos, news and more. With millions of users, Viki is subtitling popular shows from around the world into over 150 languages, making many programs accessible to a global audience for the first time. Viki features a wide range of programming, including popular TV shows, movies, music videos and news programming, and has partnered with leading content producers such as the BBC, A&E and the History Channel. Users simply sign into Viki using their Facebook account, and can then view the video they want to watch. 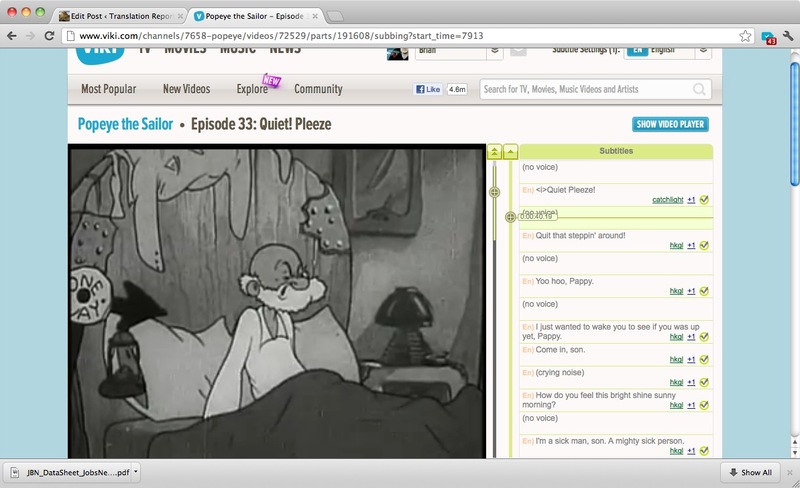 Contributing subtitles and captions is done via a sidebar widget displayed to the right of the video player (see screenshot). Streaming video player with caption editor. The service has seen impressive growth over the past two years and has become the dominant player in crowd video translation. Similar services include Amara (Universal Subtitles) and dotSub, both of which provide crowd captioning services. This entry was posted in captioning/subtitling, crowd translation, translation community and tagged caption, captioning, subtitles, viki. Bookmark the permalink. How do you “upload” the subtitles back to the server to be shared? How do i know if a show i am watching is subtitled on your service?